Already Tuesday time again, where does the time go? Halloween in two days-wow. I've been busy painting up a storm with my Annie Sloan chalk paint and Miss Mustard Seed Milk paint. Give you a little peek of one item that I have been working on and messed up. 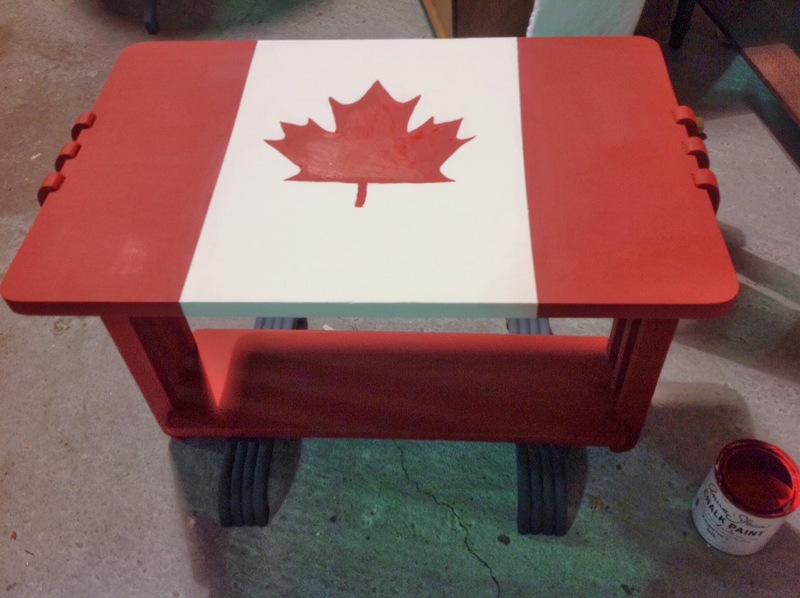 This is my Canada table that I painted the other day and needed to be distressed, not as easy as it should be, my red is running into the white, like washing clothes. Aren't they pretty, having tea in our family room. This is an old two drawer table with leaves that I painted. 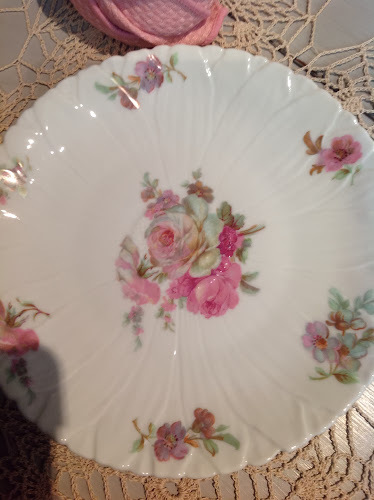 Table cloth my grandmother made when she was a young bride. It was tice as big and she cut it gown, have no idea what she did with the other half, probably through it out, or maybe unwound it and reused it. 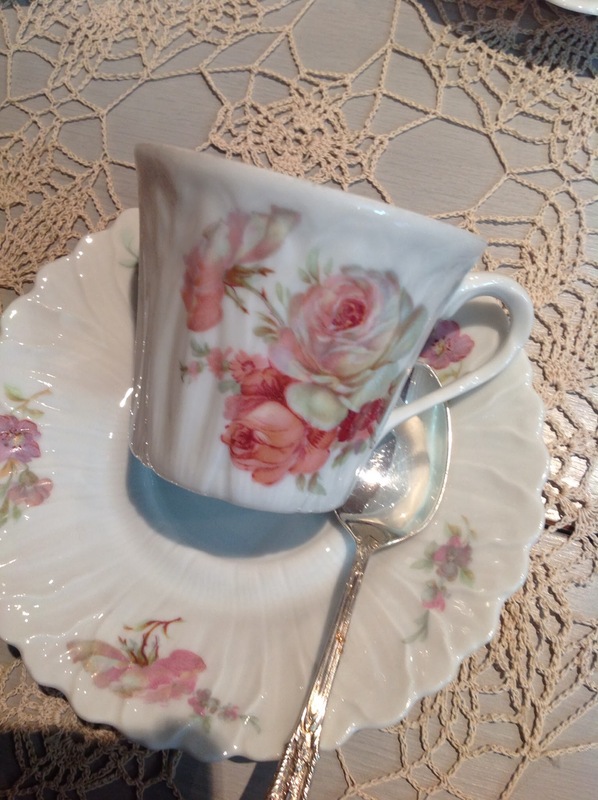 It is so delicate. 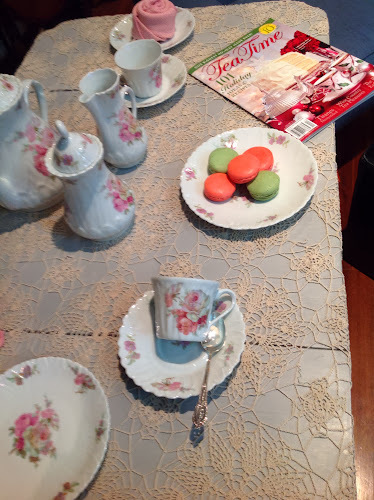 When we are waiting for the tea to steep, have a macaroon and check out the new tea time. This writing is different than the tea cup. Today has been pretty exciting, I signed my contract to be an Annie Sloan stockist, go for training, November 20, 21st and then will get my paint hopefully the first of December. I am so excited about it. I am already a Miss MustardSeed Milk Paint retailer, been a lot of work to get here, but something tells me the okra is just beginning. 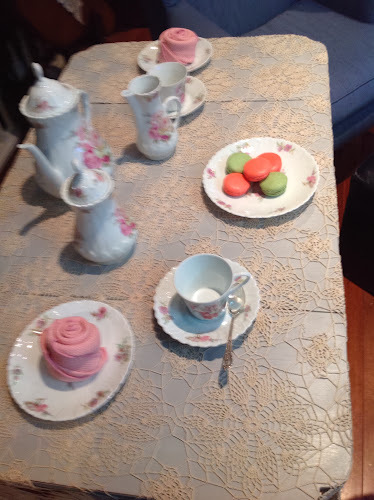 I'm actually going to a tea tomorrow on Tuesday! You have gotten me in the spirit of it all! 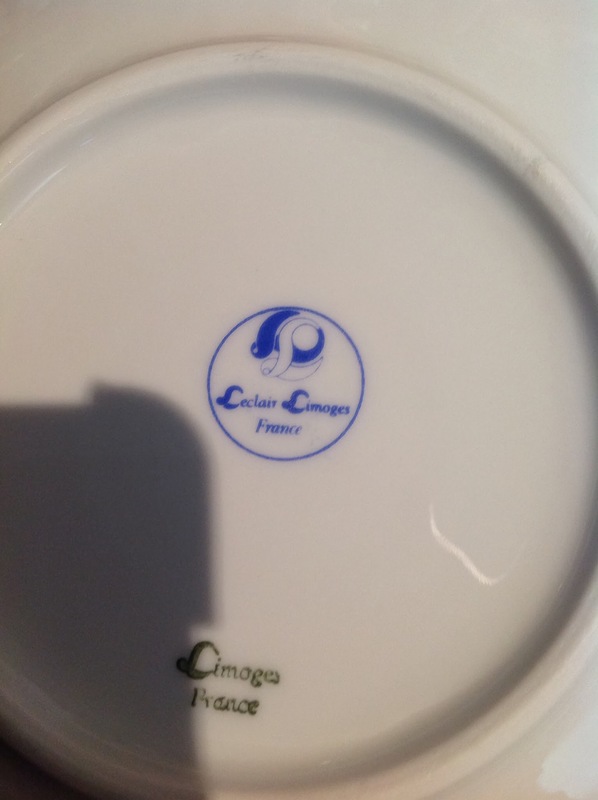 Your china is gorgeous. Thank you for inviting me to your tea party. Your new Limoges tea set is gorgeous! 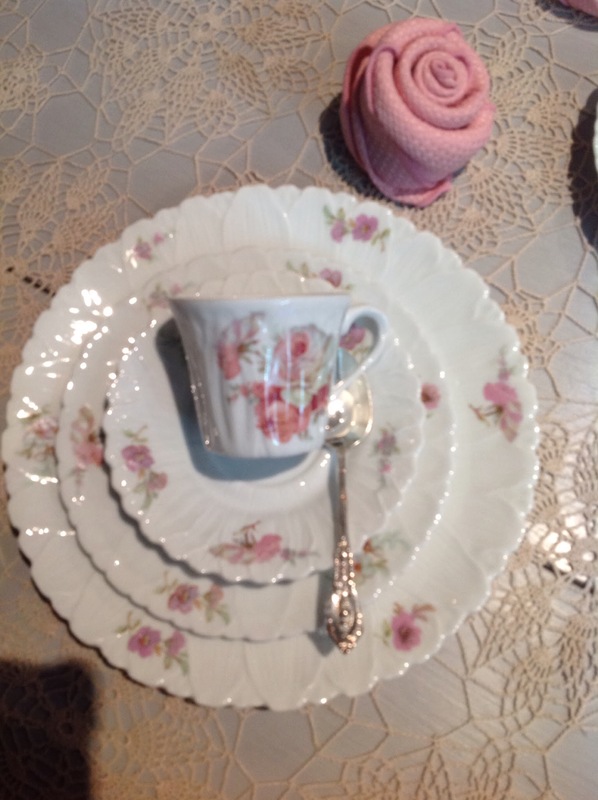 It's such a sweet pattern, and your grandmother's lace tablecloth is a real treasure! Congratulations on your being a Miss Mustard Seed retailer! How exciting for you! 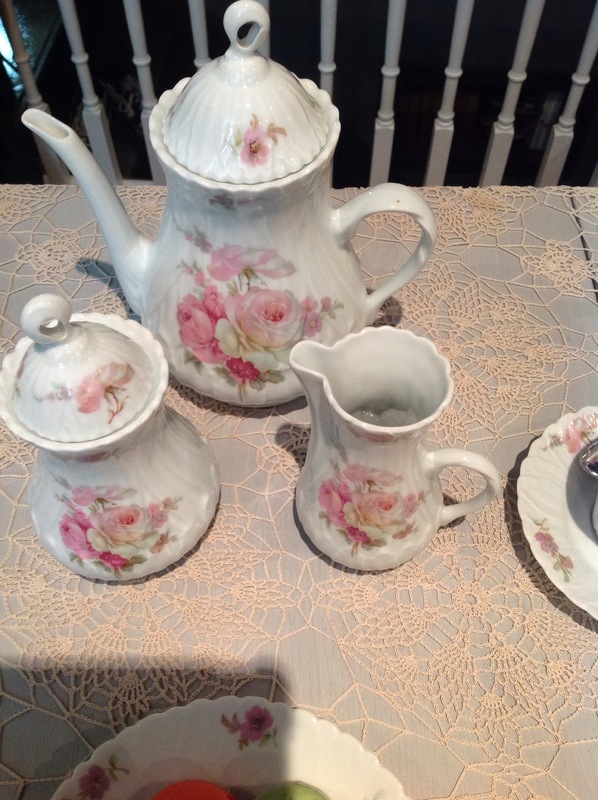 Thank you for sharing with us and joining me for tea. Have a lovely week. 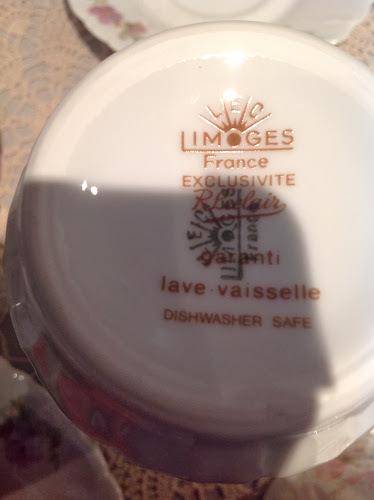 What a great find the Limoges set is! Beautiful. 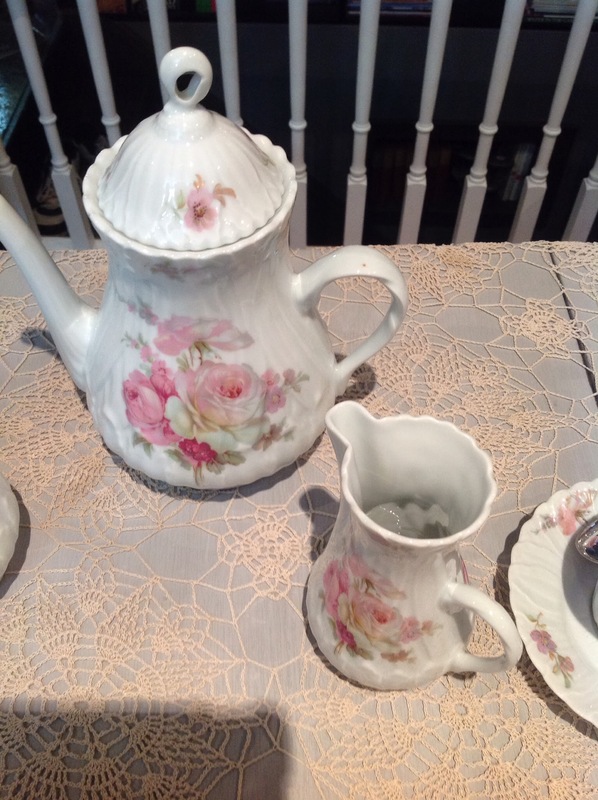 I love old linens -- the stories they could tell! Congratulations on being a Miss MustardSeed Milk Paint retailer and now stockist -- exciting times! Happy Tea Day! The Limoges china is pretty and I like the Canadian flag table you painted. Really lovely! Greetings from Montreal. Happy New Year Betty! I hope you enjoyed the holidays and looking forward to a fresh new year. Thank you for stopping by for tea today. I have missed you and hope all is well. Hope all is well as I see you haven't posted lately! Just saying hello!